LARIMER COUNTY, Colo. - A man arrested on suspicion of driving under the influence tried to lie about his identity over the weekend, but an iris scan proved who he was, according to Larimer County Sheriff Justice Smith. Maybe it's just me, but this is the first time I've heard of any police or sheriff's department using this kind of technology to positively identify someone suspected of a crime. So naturally, they would have already had a scan of his iris on record, and I didn't know they were already doing that as standard process — since 2007 at least — much like your average finger printing. In a way, I'm also glad I'm not intimately aware of this. Wondering if colored contact lenses would defeat the scan or not. Link to main article here. 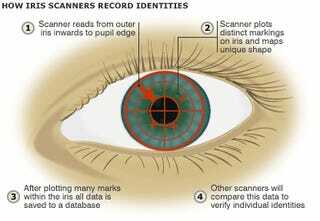 Link to very informative BBC article on how iris scanning works here.